It is an unwritten rule in auto journalism to remain impartial when reviewing a new car or truck. Or at least try to keep those personal biases in check. I have to admit I have been looking forward since last year to test drive Ford’s all-new F-150 pickup. And I have to confess that I am partial to Ram 1500. In other words the Ford F-150 has an uphill battle against my bias. On the flip side of the coin not only has the F-150 garnered lots of kudos from the auto press and buyers, it is truly a game changer. There has never in the past been a pickup truck like the F-150 that has provided such a revolutionary leap forward from a previous model year (perhaps the 1994 Dodge Ram comes close). The revolution in this case is the 2015 F-150’s new aluminum body panels which shed an amazing 700 lbs versus the 2014. It is a well known fact that Ford has mastered the commercial pickup market. Businesses that buy F-150s wouldn’t keep coming back to Ford for replacements after heavy long term use if they weren’t reliable. And for pedestrian buyers, the F-150 seems to fit the bill for everyone from the back woods country dweller to latte sipping suburban buyer. But where the F-150 has fallen short in past model years has been fielding a luxury version of its pickup. Ram on the other hand has mastered this market, its 1500 Limited has available all the luxury and convenience goodies to easily satisfy the typical Range Rover buyer. Everything from its classy big rig exterior look to its luxurious interior cabin and state-of-the-art NAV system. And its standard coil and optional air suspension give the Ram 1500 a luxury car type ride without losing any of its utility. And when equipped with Ram’s ultra-torquey 3.0 liter EcoDiesel V6, the 1500 Limited Laramie easily hits $60,000 which for a pickup is a lot of bananas. Ram dealers can’t keep them on the lots even with these high prices proving that the 1500 Limited model provides exactly what the luxury oriented pickup truck customer wants. The luxury pickup market segment may be small compared to the other pickup market segments but it is the fastest growing. This is why it is so important for Ford to field just the right version of its F-150 to compete with the luxury offerings from Ram, GMC, etc. The big question is – does Ford finally provide what luxury truck buyers want with the 2015 F-150? I’ll answer this question later. 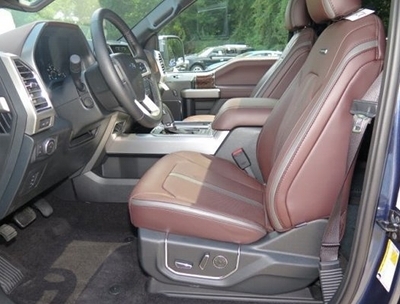 For this article I decided to test drive the most luxurious F-150 model – the Platinum. Anyone who hasn’t been on a deserted island the last year has observed Ford touting its phenomenal twin-turbo 3.5 liter EcoBoost V6 engine as a must have F-150 option. I wasn’t so convinced so I opted against test driving a F-150 equipped with the 3.5 liter EcoBoost. Now don’t get me wrong, I am a big fan of the 3.5 liter EcoBoost and have been since the first time Ford reps handed me the keys to test drive a brand new 2008 Taurus SHO with this motor. Today it is just as ahead of its time as it was then eight years ago. Part of the reason Ford is pushing the 3.5 and 2.7 liter EcoBoost V6s is both are the way of the future. The ever increasing Corporate Average Fuel Economy (C.A.F.E.) standards are unfortunately forcing automakers to smaller more fuel efficient motors. In other words Ford sees the writing on the wall and is preparing its customers for a time when the F-150 will be without a V8 option (perish the thought). For now the V8 is still on the F-150’s option list and standard with the Platinum. The V8 powered Platinum was the perfect tester for my review of the new F-150. After-all good old V8 power in a full-size pickup is the only way to fly as far as I am concerned – it doesn’t get more American than that. No hissing V6 with turbo whine for this test. Only the mellow tune of a V8 would suffice. The standard engine and only V8 available with the Platinum is Ford’s SOHC 5.0 liter V8 – it is also the only V8 available on other F-150 models. Pop the hood and the 5.0 V8 appears simplistic in comparison with the more complex 2.7 and 3.5 EcoBoost V6s. It is a slightly detuned version of the Coyote 5.0 liter V8 found under the hood of the Mustang GT. It is the Coyote architecture that keeps the F-150’s 385 horsepower and 387 lb/ft of torque 5.0 liter V8 very competitive. It almost matches the Ram 1500’s 395 horsepower and 410 lb/ft of torque 5.7 liter Hemi V8 which is .7 liters of displacement more. Additionally, it easily beats the Chevrolet Silverado/GMC Sierra 1500’s 355 horsepower and 383 lb/ft of torque 5.3 liter V8 which has a .3 liter advantage. However the Coyote 5.0 falls very short in comparison to Chevrolet’s Silverado/GMC Sierra 1500’s top engine – a 6.2 liter V8 rated at 420 horsepower and 460 lb/ft of torque. Also worth noting is that the torque monster motor for the F-150 is the (365 horsepower and 420 lb/ft of torque) 3.5 EcoBoost. Not only does the 3.5 EcoBoost have 33 lb/ft of torque more than the Coyote V8, its maximum torque is available at a very low 2,500 rpm versus the much higher 3,850 rpm of the Coyote. The Coyote 5.0 gives the F-150 a 9,100 – 10,100 lb towing rating (depending on rear axle ratio, and other factors). The 3.5 EcoBoost boasts a better 10,700 – 11,800 lb towing rating (also depending on other winder sticker options chosen). And if you absolutely most have the extra torque and higher towing capacity with the Platinum, the 3.5 EcoBoost will add a premium of $400 to the sticker price. And for those concerned about gas mileage the 3.5 EcoBoost will get slightly better gas mileage 17 city/24 highway (17 city/23 highway when equipped with 4-wheel drive) versus the Coyote 5.0’s 15 city/22 highway (15 city/21 highway when equipped with 4-wheel drive). The Coyote 5.0 liter powered Platinum is like a thoroughbred race horse, it is big and powerful. It is the most powerful V8 powered F-150 ever (barring of course past SVT souped-up versions). You hit the pedal hard the Platinum lunges forward with so much force throwing you back into the seat. Traction was very good off the line with the tester’s electronic locking 3.31 rear axle. Word to the wise the open 3.31 rear axle (which is standard on the Coyote 5.0 liter equipped Platinum) won’t launch as quickly (due to wheel spin issues) as the electronic locking version. There is an available electronic locking 3.55 rear axle for the Coyote equipped Platinum and an electronic locking 3.73 which is only available on the 4-wheel drive version of Coyote Platinum. There is no doubt that the 700-lb weight loss when compared to the 2014 model makes a big difference, allowing the Coyote 5.0 to accelerate much faster than the 2014 with the same motor. And of course the harmonic sound of the V8 is far superior to that of the 3.5 EcoBoost – this is reason enough to forgo the EcoBoost. The 5.0 is king banana in my book. Only fault I had was with the mandatory single exhaust, though it had a chrome tip it was a little too quiet. It would be nice if Ford would offer a dual exhaust option like Ram does with its 1500. The Coyote motor is mated to a mandatory 6-speed automatic transmission which shifts with perfect precision – it is as smooth as glass and always seems to be in the right gear at the right time. The real surprise in driving the Platinum is the nimble handling, it easily had me fooled it was a much smaller sport car like vehicle rather than a big boxy truck. Absolutely no leaning or dipping into the turns, the Platinum would go wherever the steering wheel was pointed with no fuss or screeching of tires. What made this so surprising was this wasn’t the 2-wheel drive version, it was the 4-wheel drive version with the FX4 off-road package that I road tested. The 20-inch polished aluminum wheels with beefy 275/55-R20 all-terrain tires wanted to carve up the curves. And the 4-wheel disc brakes helped stop the truck with ease. As surprised as I was at how the Platinum drove, the interior and the multitude of standard and optional luxury items made my head spin. It is human memory overload. I could write about every option in detail but it would be too long winded and better suited as a book. Just imagine all the conceivable options on a new high-end luxury car and they’re all available with the Platinum. 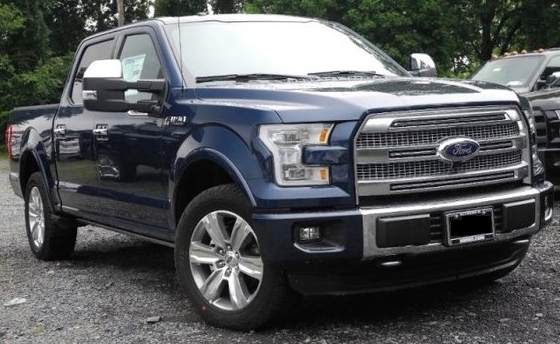 After-all the base price of a 2015 F-150 is $26,330, my Platinum tester had a base price of $54,775 and enough extra options to choke a horse making the final price a whopping $63,535. The magnitude of options are only part of the story, the real story is how inviting the Platinum interior is. The soft leather (heated and ventilated) seats are subjectively among the most comfortable found in any new vehicle. The seating position is perfect with absolutely perfect visibility out the front and side glass. The split side mirror design (big mirror on top and parabolic mirror on bottom) made the Platinum absolutely free of blind spots. 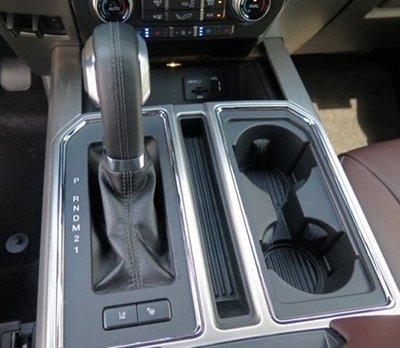 The center console automatic shifter was perfectly placed and had just the right feel when shifting – Ram could take some notes here since its 1980s Tron arcade game round (hockey puck type) dial is a joke compared to Platinum’s macho shifter. 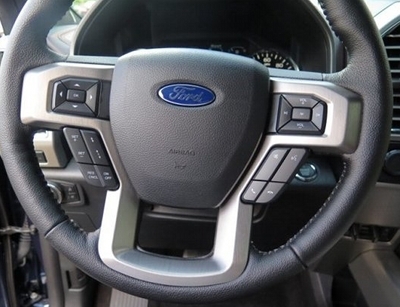 The cheap feel of the interior of previous F-150 models is gone with the Platinum, all interior panels are fine quality and the overall fit and finish was “A+”. The only flaw in the interior that I could find was the leather wrapped steering wheel which was an attractive design however its gripping area seemed to possess a cheap pleather type look which didn’t match the rest of the upscale interior. The Navigation/SYNC with MyFord Touch system is well setup system and has many features – expect a learning curve period to figure out how everything works. 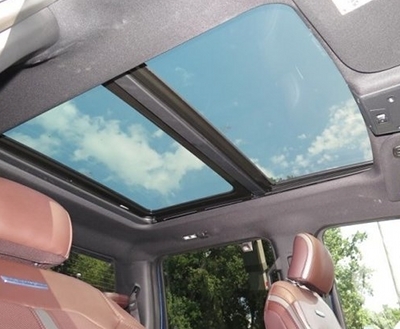 The dual pane retractable moon roof is also a must have option, it gives a great open air driving experience along with brightening up the large cabin when the shade is retracted. The Platinum is only available in the SuperCrew 4-door configuration. This gives the rear passengers full doors as large as the front doors for easy entry into the massive rear cabin. 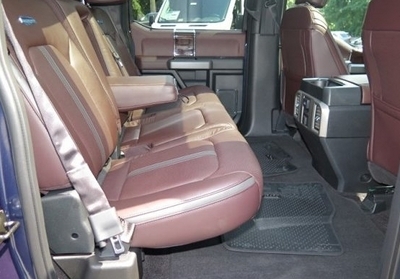 And when I say massive I mean massive – the hordes of leg room will put even the largest stretch limousines to shame. However the real surprise was the Platinum’s perfectly placed electronic movement running boards. I have jumped, climbed, and twisted into all sorts of full-size pickups over the years. The Platinum was by far the easiest to move in and out. The problem for me is I am 6’3″ and most running boards don’t help me but are a hinderance – they are usually not placed correctly so I find myself stretching over them. Not the case here, I opened the front driver door and the running board folded out (quietly I might add) and then I stepped on it and glided right into the driver’s seat. And the same was true on the other side of the vehicle and also when entering through the rear side doors. Making sure it wasn’t just me, I had a former pickup truck owner (who is 5’10”) try these running boards – he was left with the same conclusion that these were the best running boards he had encountered. 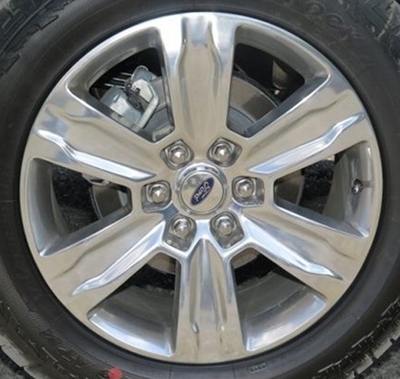 It is little details like this that show how Ford has left nothing for chance. The F-150’s new exterior is very appealing. Its styling doesn’t smack you right in the face like the Ram 1500 which screams muscle and strength. The Platinum is more graceful and charming in an understated way. However the more you look at the lines and all the nooks and crannies of the exterior sheet metal you will usually find yourself taking a strong liking to its style. The Platinum’s bright trim work even on the grille is well done, it advertises to onlookers that this is a luxury pickup without being gaudy like some pickups. The Platinum I test drove had a dark blue color called Blue Jeans, at first it seemed mundane however after 10 minutes in the Platinum’s presence I was hooked on the color. 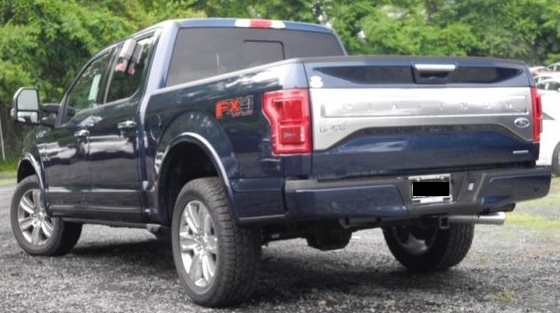 If there is any hesitation among potential buyers concerning purchasing a Platinum or any other F-150 model it is going to be the aluminum body panels. Some of us have heard the stories for years about the sixties era Shelby Cobra with aluminum body panels where even a light press on body with a hand, easily left a permanent hand imprint. Fortunately aluminum has come a long way, think of the really durable heavy duty aluminum on passenger jets, that is what you have with the F-150. It is super light but very strong and durable. Even tapping the panels with your hand gives back the feedback sound of solid metal and not an aluminum Coca-Cola can. The other potential problem is the higher cost of repairing damaged body panels when compared to traditional steel. Edmunds seems to have put these fears to rest by taking a sledge hammer to a 2015 F-150 and having the repairs performed at a local Ford dealer. Edmunds discovered the cost was more than a steel body pickup but still reasonable and that the Ford dealership technicians did a first class job fixing the body damage. 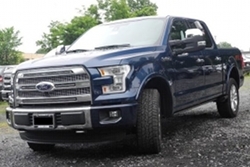 I have analyzed and reviewed my share of new pickups over the years, I always found myself concentrating on the pickup truck bed and the utility related features first. With the Platinum I forgot about these features – it was if in my one-track mind I was testing a full-size luxury SUV such as a Cadillac Escalade or a Lincoln Navigator. It wasn’t until after spending some time behind the wheel and having my brain compute all that the Platinum had to offer that I released that my tester had a 5.5′ pickup bed. A 6.5′ bed is optional and seems to be a industry standard for 4-door pickups. Here’s the good part you don’t need the 6.5′ bed if you get the foldable pickup bed extender ($250 option) – this allows you to drop the rear tailgate and adds about 2 extra feet of cargo length to the bed. The tester was also equipped with the optional stowable loading ramps ($595) which are a must have option for anyone hauling a motorcycle or lawn equipment. The bed box side steps ($325) are a must have option for anyone wanting to access the bed from the side. And when the electronic tailgate was down a slide out step with railing was a great feature which made the task of climbing into the bed as easy as a walk in the park. The biggest dilemma here is the Platinum is such a great looking truck do you want to really dirty it up by carrying cargo in the truck bed? Only you the buyer can determine the answer to that question. The F-150 has dominated its market the last 3 decades, the Platinum will ensure it extends this dominance to the rapidly growing luxury truck market. The Platinum is a game changer. It is a fantastic package, only warning I can give is if you want one with V8 power you better buy one soon. It won’t be long before the V8 is gone, and when it is gone it will most surely be missed. In closing there is a symbiotic relationship between country music and full-size American pickups. I am not a big country music fan having grown up in suburbia however I do on occasion listen to it and enjoy it. I have learned over the years that one of the main components of a good country song is the telling of a good story. If I was a country music artist I would write a song called “Give Me The Keys And Let Me Be”, because this tells the story of how I felt when driving the 2015 F-150 Platinum. I didn’t want to be bothered with anything, I just wanted to drive and enjoy the scenery in one of the best pickup trucks ever produced. And by the way, if you do happen to write this country song using my title, I expect a $63K royalty so I can afford to purchase a Coyote powered Blue Jeans colored Platinum. This pickup is just that good – enough said.